We are temporarily out of stock due to exceptionally high demand. Order your Qettle now to guarantee delivery by Friday 3rd May. The water supply pressure must be between minimum 1.5 BAR (22 psi) maximum 5 BAR (73psi). A 230 volt 13 amp domestic electricity supply is required for the boiler tank. QETTLE is engineered to our own 4-in-1 kitchen tap patent that has been fully granted in the UK, USA and China. 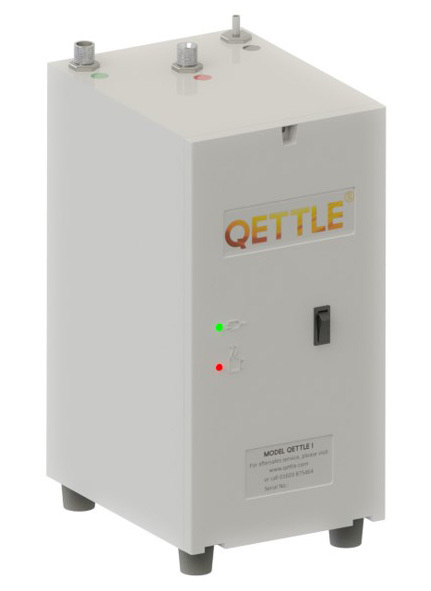 More an appliance, than a tap, QETTLE dispenses four flows of water. Filtered 100°C boiling water, filtered drinking water, plus normal hot and cold flows. 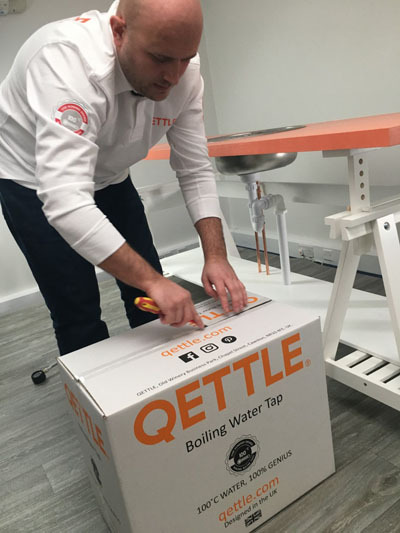 Safe, yet intuitive, QETTLE boiling water taps couldn't be easier to use. 100°C boiling water or cold filtered water is dispensed by using the round handle. For boiling water, the tap's safety clip must be removed. Then, you press the button and turn the handle clockwise. To dispense cold, filtered drinking water, the handle is turned anti-clockwise. Normal hot and cold flows of water are dispensed using the lever handle. 8 mugs of tea, 4 cafetieres of coffee and at least 1 large saucepan of boiling water... You won't exhaust a QETTLE tank easily. Its generous 4 litre capacity will keep you in cups of tea and coffee with plenty left over. If you do run dry, the tank takes just 10 minutes to come up to temperature again. 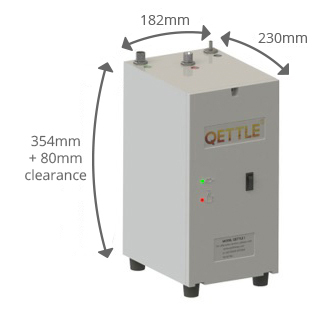 The neatly proportioned QETTLE boiler tank measures 354mm high x 182mm wide x 230mm deep. It'll fit under your kitchen sink, whilst still leaving space for all the essentials. On standby, it costs just £0.03 pence a day to run a QETTLE. Inside the boiler tank, water is stored at 105°C and this, plus the tank's insulation, means that your boiling water will always be just that – boiling. Not, near-boiling, kettle-hot or steaming – but truly boiling at 100°C. QETTLE boiler tanks are CE approved. Every tank is individually quality tested in the UK. 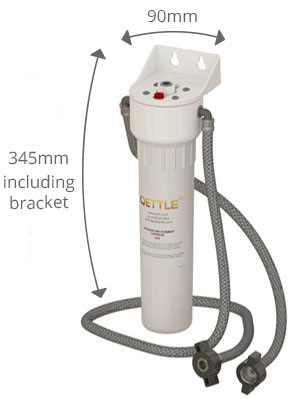 The QETTLE filtered water system and cartridge has been designed to deliver great-tasting drinking water – free from unpleasant contaminants and chlorine – whilst also inhibiting the build-up of scale inside the boiler tank. Filter cartridges should be replaced every 6 months. 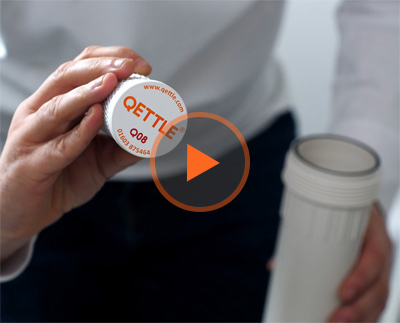 QETTLE's cleverly designed filter cartridge housing allows you to change your tap's filter cartridge in minutes. 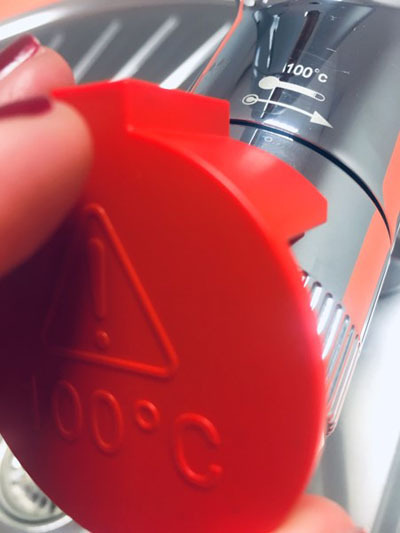 It's an easy job and we've integrated a pressure release button into the housing to ensure trapped air doesn’t create a seal that prevents you from opening the housing. Even though it's out of sight, we've designed the QETTLE filter system to be as neat and unobtrusive as possible. Measuring 345mm high x 90mm diameter, the filter cartridge housing sits on a fixing bracket underneath your kitchen sink. When it comes to replacing your QETTLE boiling water tap filter cartridge, it's only the cartridge – not the housing – that you'll replace. So, unlike a number of hot and boiling water taps, you won't be contributing to landfill by throwing away a plastic housing or canister. 90% of the QETTLE filter cartridge is recyclable, too. A QETTLE boiling water tap is safer than a kettle. After all, it's a fixed object – a tap can't be pulled or toppled by a cable. Kettle scalding incidents are often severe because of where the kettle and its volume of boiling water fall. Sadly, smaller children will often sustain burns over the upper parts of their bodies. If you're new to boiling water taps, it's natural to be concerned about safety. But all QETTLE boiling water taps come with a safety clip, that, when in position, make it impossible for boiling water to be dispensed. And, even with the clip removed, an exact action is required to dispense boiling water. Taps with round handles must have their button control pushed down, whilst also turning the handle clockwise. These are precise actions that, especially whilst holding a mug, teapot or saucepan, cannot be executed accidentally. 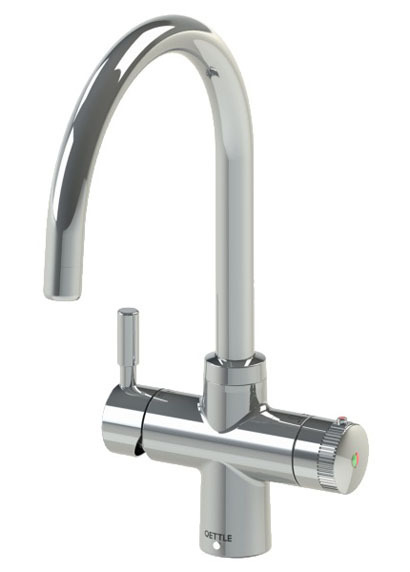 The intelligent construction and materials of a QETTLE boiling water tap's spout means that with the exception of its very tip, the spout is safe to touch whilst boiling water is being dispensed. QETTLE couldn't be easier to install. It's fuss-free fit is the result of the design team's cross-generational experience of kitchen taps, compact water boilers and filter systems. QETTLE taps come with step-by-step installation guides that walk you through the fitting procedure. We detail system requirements, pre-installation checks, cover planning the layout of a QETTLE system inside the kitchen cabinet and include trouble-shooting.